In an earlier post, I mentioned the possibility of doing a side business in baking. However, I have decided not to pursue that at this time in order to concentrate on radio, particularly as the LPFM filing window approaches. Part of my decision is due to the renovation that our kitchen needs at this time. Our house suffered severe water damage, which we are still dealing with. We are on a waiting list for the Fuller Center to come with volunteers to help us with all the necessary renovation work we need to do. I also feel like I can't compete with all the bakeries and folks in town that are able to decorate beautiful baked goods. Mine taste great, but the appearance just can't compare with them. So I will bake for a hobby and for enjoyment - but as a business, no. I'm just not that good. At least I don't think so. Big D Country is concentrating solely on country music, with an added emphasis on adding to our classic country music offerings. I know there are two camps: "I hate the new stuff and like the old stuff" and "I like modern country and hate the old twangy stuff" but I don't fall into either. I like, and dislike, certain songs in both groups. I feel like for those who like some of all of it, Big D Country is unique in offering such a wide variety. Yes, there are others, and I have heard some of them, and like them. But remember, I have a goal to get Big D's format over the air on FM in Tallahassee. There are no local listening options even remotely close to our format. Thanks to CDX Nashville, New Haven Records, Vic Aderhold, Monte Butner, Thomas Hand, Erwin O'Conner, WCVC-AM, the now silent WJEP-AM and others who have helped with programming and music. Your help and contributions are very much appreciated!! Thanks to a couple of record distributors, we now have an even larger selection of classic country music and country gospel music. New Haven Records recently sent us a package of CDs ranging from country gospel to bluegrass gospel music. I have already begun playing some of this music during the SUNDAY GOSPEL program. The classic country library will take longer to complete. 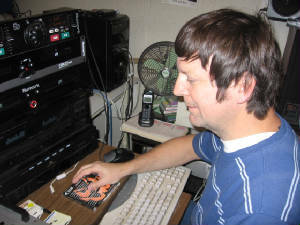 It is an ongoing radio service that currently has 500-plus discs in their inventory. I am working backwards from most current to oldest in adding this music to our library. This is really filling in some of the gaps I had in the collection. With the advent of the possible LPFM around the corner, I am working hard at "bulking up" with as much music as possible for the primary classic country genre. We will basically play a wide variety of country music from roughly the early 1960s to the present. North Florida has no classic country station now. If you are able, I hope you will support this endeavor with your financial contributions, goods, or services. Thank you.